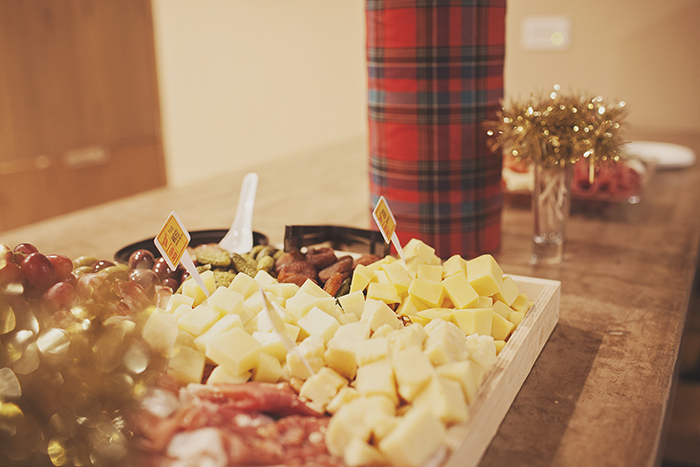 As a fun alternative to the “Ugly Sweater” holiday party theme, we suggested our client build in a Mad for Plaid theme, encouraging guests to dress for the occasion. As you can see, everyone did just that! The signature cocktail setup was probably my favorite part of this party! We thought it would be fun to serve two cocktails out of glass punchbowls, but added some fabulous LMP details, of course. First up — Christmas Sangria, complete with diced apples, sweet cranberries, and rosemary dusted in sugar crystals. Gorgeous, right? Oh and it was delicious as well! 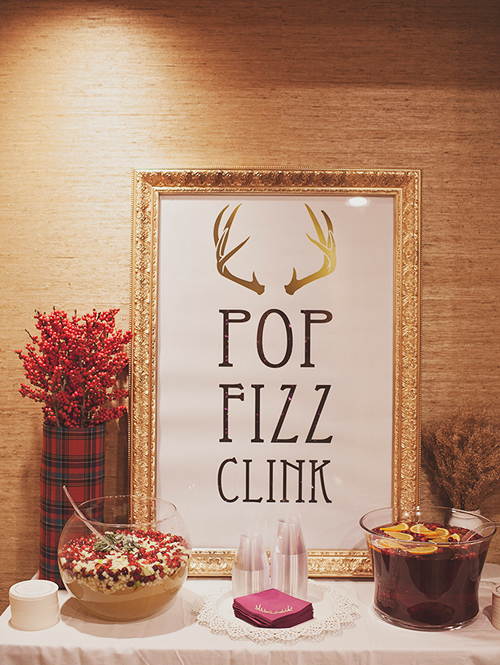 Second, we served a sparkling holiday punch which we spiked with vodka, this was a party after all! A large sign POP CLINK FIZZ stood as the backdrop to the drink station. Plaid fabric wrapped vases filled with red holly branches and gold dipped babies breath were placed on either side of the sign. Custom coasters were printed so guests were able to take each cocktail recipe home with them. And what Christmas cocktail setup is complete without reindeer printed beverage napkins? 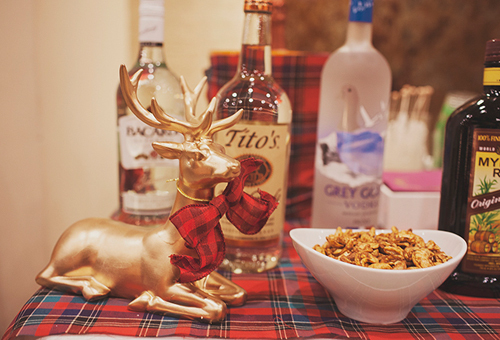 The bar was fully stocked, complete with gold sprayed reindeer sporting festive plaid bow ties and tumblers& beverage napkins from Party City. Absolutely love these reindeer swizzle sticks from The Cake Girls. The perfect addition to a well stocked bar. For an amazing food spread we turned to our friend Karen, aka the Cocktail Party Chef. She came up with a delicious menu including mini spareribs with a pomegranate glaze, roasted brussel sprouts with dried cranberry gorgonzola breadcrumbs, beef negamaki rollups with asparagus and grilled scallions…are you drooling yet?? The list goes on! Persimmon and proscuitto flatbread, make-your-own bruschetta station, hogs in puff pastry, white and red crudités with pink peppercorn buttermilk dip with shaved candy cane beet garnish…amazing right?? Not only is Karen’s food so incredibly yummy, it’s gorgeous as well! Check out these shots! At the center of our food table was an adorably short and round Christmas tree we wrapped in bright fuchsia lights and hung plaid ornaments. 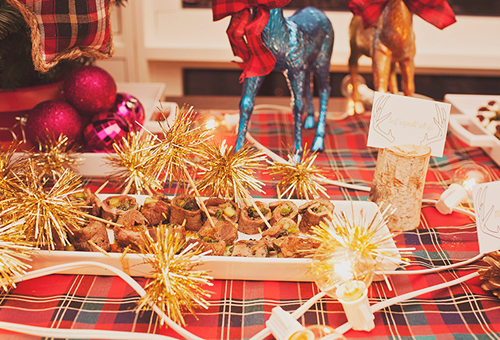 We fell in love with these ceramic reindeer, so we also put them at the center of the table…and of course they also sported plaid bow ties. Pinecones and birch branches held the food place cards and large circular bulb lights were laid around the table for an extra Holiday glow. Stunning! The holidays are all about sparkle, so a large gold shiny Christmas tree from Target was the center of the dessert spread. Annmarie, our go-to dessert girl hooked us up with some yummy sweets! Check out these gingerbread cookies…complete with plaid outfits and bowties! We also had snow covered cake pops set atop red and green M&Ms, and delicious and rich fudge topped with crushed candy canes. To die for! 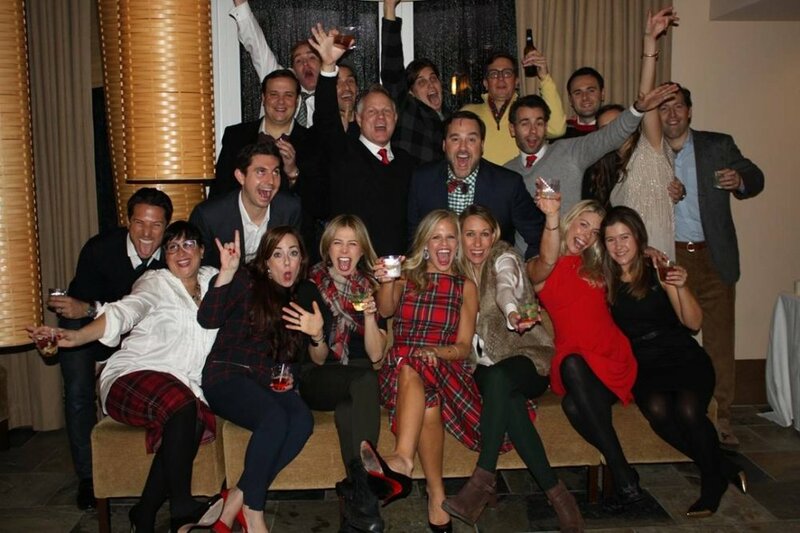 Every holiday party has a little too much booze…and this one was no exception. That’s why also served up cupcakes from Prohibition Bakery. What is so special about cupcakes from Prohibition Bakery you ask? Why they are only the cutest, most delicious (and boozy!) alternative to boring party cupcakes! With flavors like Margarita or Beer & Pretzel these truly are the perfect one-bite wonder. Below the dessert table we strung homemade garland. So easy using inexpensive jewel-toned ornaments from target, mixed in with plaid ornaments from Crate and Barrel. Easy and gorgeous! In addition to a food table, we love to place other snacks at the other end of the room to keep the flow of the room going. And what better snack than a Murray’sCheese Plate. Asking for all cheeses pre-cubed is a great option for a larger party as it’s much easier for guests to pick up and nibble on. And don’t forget the sparkly toothpicks!! 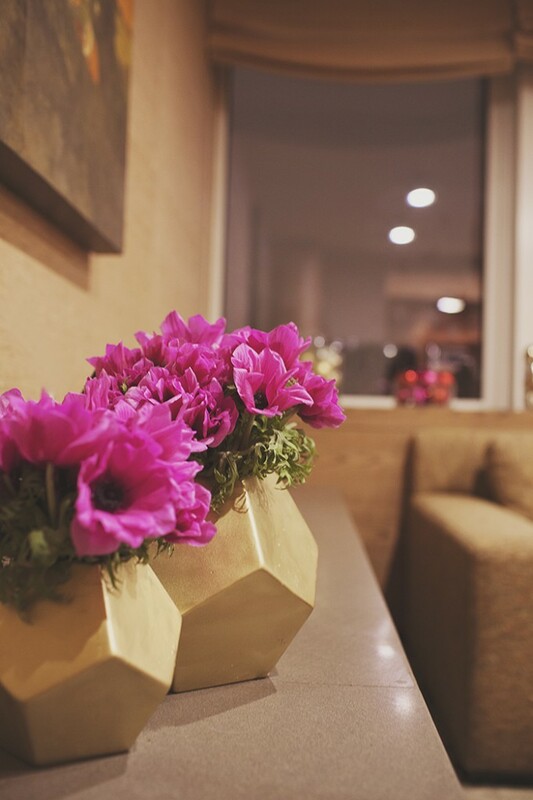 We found these fabulously modern faceted vases at Dwell Studio…and of course we immediately spray painted them gold and filled them with gorgeous fuchsia flowers. Along the window ledge we filled different sized apothecary jars with shiny jewel-toned ornaments for another pop of color. Check out these glass domes we filled with bright pink lights and pine cones as centerpieces for the coffee table. To add to everyone’s festive decor, we set out a bowl of fun items from Party City for everyone to dress up in. The oversized bow ties and blinking necklaces were a hit! It was a great night and a super festive celebration!! Merry belated Christmas from Little Miss Party Planner…only 352 days until Christmas 2014!! Wooo hooo! !